Well. Another Kasie West book came out, so I bought it and read it. Pretty much just how it goes around here! This one was about an artist girl who the summer between her junior and senior year is hoping to get her paintings into the art show at the gallery she works for. Well, the boss dude said, um, yeah, they are good, but there is no HEART. No EMOTION! So yes, another cute fun story with relate-able characters with real life issues. I love this stuff. But you all know that already. 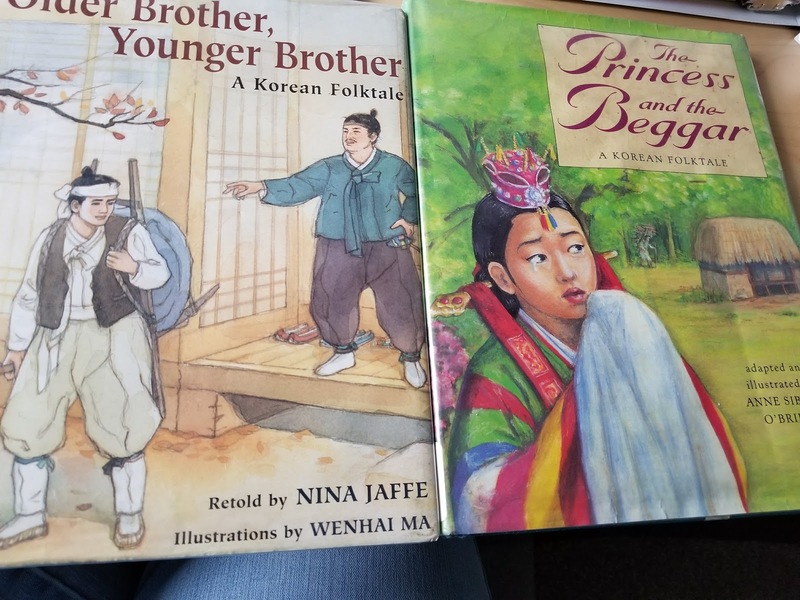 The current drama I'm watching is based on an old Chinese folktale, so the other day when I was at the library it dawned on me that I could probably find a version of this story and learn more. 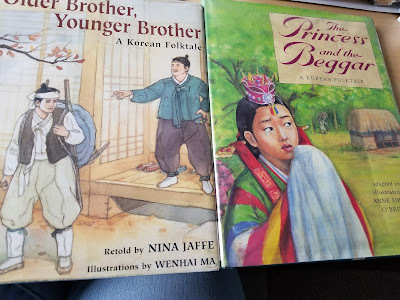 And while I was at it I found a couple of Korean folktales too. I love this crossover learning thing, where one thing leads to another that leads to another. Watching a drama that seems a bit silly in its presentation and then I learn that it's based on this very old story that is a bit... yes.. silly. And yet, I'm learning this old stuff in a very fun way. I love it. It will be interesting to see if I can find any similarities between the drama and story. So anyway, I'll be reading and reviewing these books soon. I hope you enjoy going on my learning journey with me. The drama I'm watching right now? 2017, Son Oh-Gong and Ma-Wang are in conflict with each other as they look for a true light in a dark world where evil thrives. Having made a contract with Seon-mi 25 years ago, entitling her to seek help from Son Oh-Gong whenever she calls him in exchange of letting him free, the two meet again in a fateful encounter. From there, Son Oh-Gong is bound to his protective role towards Seon-mi, the little girl he had met years ago. Everyone is SO EXCITED because J-Hope from BTS has finally announced the date he will release his mixtape. March 2. The world will never be the same again!! 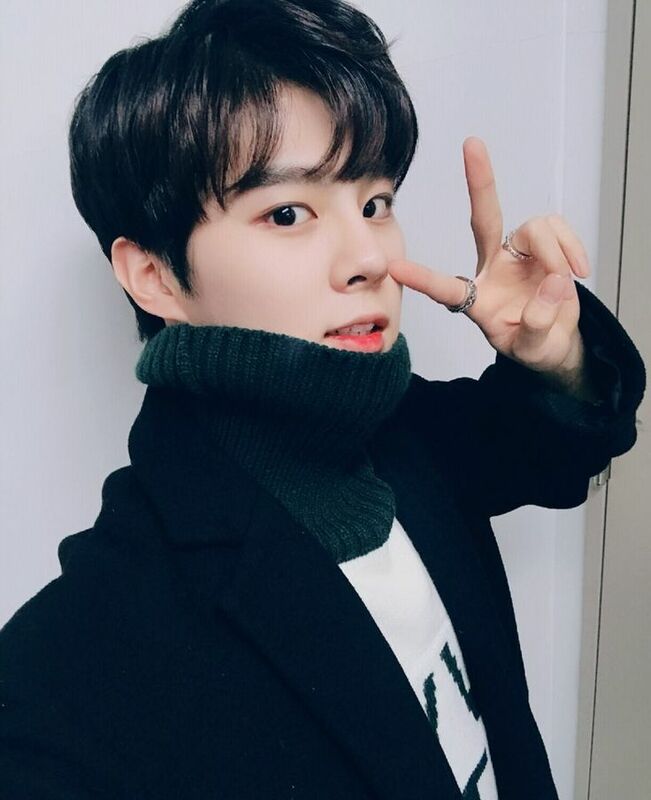 Honey10s (fans of Up10tion) are sad because we all thought Wooshin was coming back to re-join the group. Man they made a lot of hints, but it looks like it was just wishful thinking so far. But please, let him come back soon. NCT is doing some teasers that I think are meant to kill us. They released a song called Boss this past week too... but there is more to come from them. Monsta X announced they'll be going on a world tour again, but no LA dates have been listed yet. Our dilemma... do we get to have second helping of Monsta X? I would love to! Super Junior has still not announced an official date for their tours in the US. It's killing us. I'm not sure what's happening. But they have been working a ton on their TV show, which I have yet to figure out how to watch, but we are seeing a bunch of fun clips now and then. Hyuk (from VIXX), for his graduation present to us his fans, released a dance cover. Dang, that boy is growing up! We continued to fall in love with qpop group Ninety One and the day is not complete unless their songs have been played. We discovered all their instagrams and get fed often with their cute faces there. (I can't find that clip, but here's one of them just being them for you to see what I mean.) After Korean, we'll all be learning Kazakh next. Wait for it. 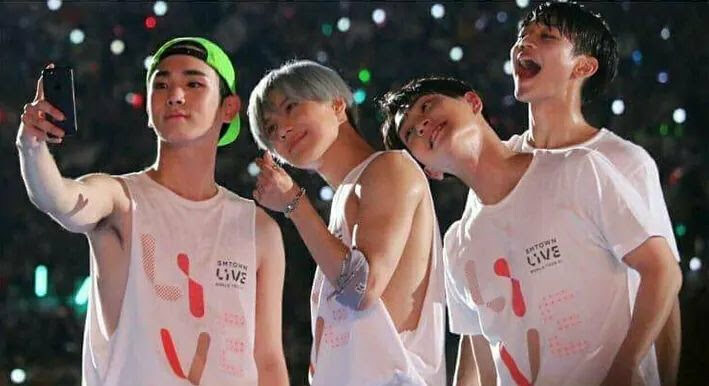 SHINee had their concerts in Japan and sang without Jonghyun for the first time. I will never forget this image. Even if you aren't into kpop and don't know these guys at all, you have to admit this is a very moving image. Yes? 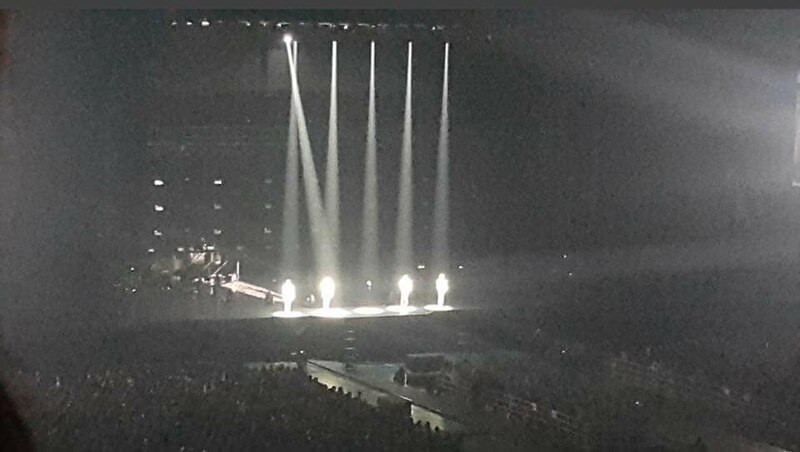 One space in the middle left for empty for Jonghyun. But even through the sadness of this, the remaining four look like they are surviving, yes? On our channel we reacted to many things this week, but here's a very short compilation we did of five kpop songs that feature whistling. You might really quite enjoy it. And it's only two minutes!! I guess that's it for this week! The kpop life continues to be full and happy and wonderful! I've been reading a bunch of middle grade books for an award for which they are all nominated. This was my favorite of the bunch. I was totally charmed be everything about it! It probably doesn't hurt that I've loved everything I've read by Ann Dee Ellis. I think it's safe to say she is favorite. This is the story about Olivia who lives with her little sister and her mom in a trailer park. Her dad has left them and so her mom is struggling to provide, which means Olivia and her sister are left alone to fend for themselves most of the time. When the book opens, she hasn't been to school for months because she's had to stay home with her sick sister. But, she finds a community in all the people that live around her, which is one of my favorite things about this book. But not only that, she is very smart and resourceful and they do a sort of home-school on their own and have a great time. Olivia hopes it never ends. But then one day her mom has to send her back to school, which is not great, but she deals. However, one day, she has to take her sister with and so she hides her in a closet. This is not really that great, yes? Meanwhile, she's made a friend that's a boy who she loves quite a lot. Together they think up all sorts of adventures. But when she finds out he goes to her school, she is worried he will learn way too much about her. But in return, she starts to learn a lot more about him too. 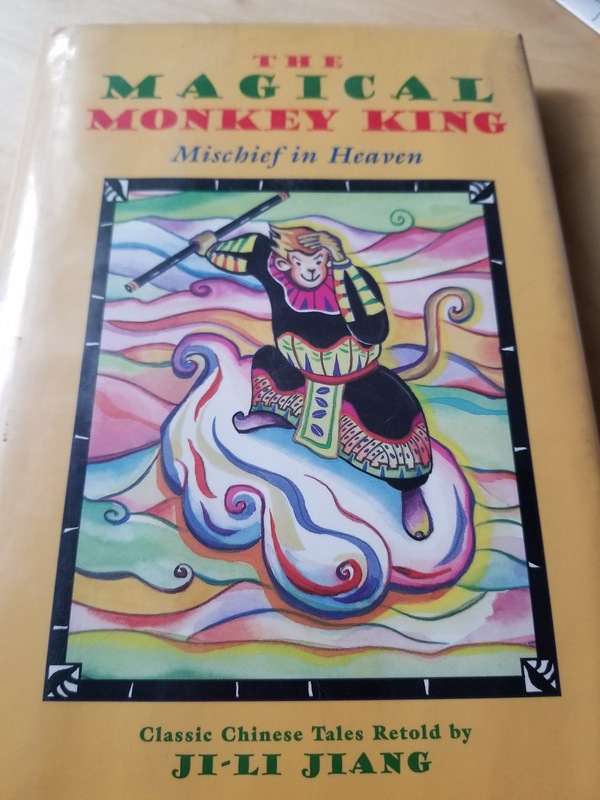 It's kind of a sad "neglected" kid sort of story, but I loved the style and the quirkiness of everyone and the spunkiness of this main character. I flew through it without any slow moments. And loved it. The setting is nearby my home and one day when I was in the neighborhood I actually tried to find the trailer park. Well, I found it, but not sure it's the one the story was based on, since the KOA is no longer there! LOL! But it was great because everything talked about in the book, I could picture. The bike path to the lake, the restaurants and stores mentioned, the rec center. Etc. Fun times. 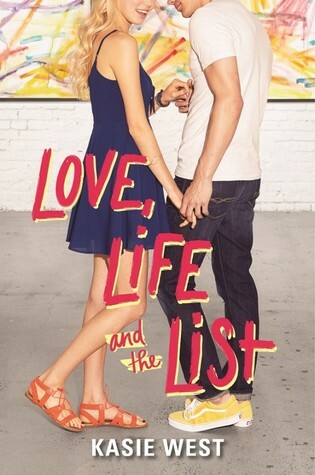 I have a YA in the stacks by this author and I think I'm going to bump it up the list and read it soon. This is cute and heartwarming story based on the true story of the authors' (they are married yes) daughter. It's about how she started having issues with her arm and leg and when they got her checked out, they discovered a brain tumor. So she has deal with that fear and ends up having a couple of operations. But it's not just about how she was brave through that ordeal, but how she deals with a sticky little situation in her 6th grade class room. How she doesn't feel included, and how she is scared to try include others. And then when she becomes the more popular kid, how does she now not make the same mistake and go ahead and include the kid that was mean to her. I read it for much of the book with a smile, but thinking...I don't know, that everything was too obvious and I was sort of being used and manipulated. You know that feeling, yes? But then, somewhere along the way, that feeling went away and I just enjoyed the story and the touching relationships formed here. At one point, there were tears. Probably because I could relate to something as a parent. That's usually what starts them. 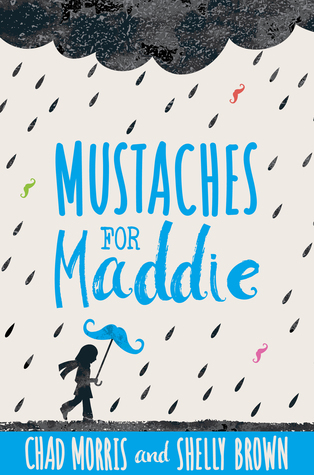 I loved that they included some blurbs at the end about what really went on with Maddie, and then there was a letter from Maddie herself. Thanks for that guys! It was awesome. I enjoyed the story. It's very simple but sweet and lovely. After much campaigning, book clubber Jenni Elyse finally got this book on our line up and it was finally its turn this past month! WOOT! However, I found that even so, my attention would wane as I listened. Either I would try to do something else and not hear, or fall asleep and not hear, or just zone off and not hear. Maybe David Tennant was just too dang lovely with that soothing voice of his. I don't know. But I tried and it was fun trying. Eventually, I did get a hard copy from the library and I happily finished it off, and then went back and skimmed the parts I "missed" from my audio experience. My thoughts? What a strange little story. And nothing at all like the movie. I was like... wait, the dragon talks? Wait, he's HOW small? Wait, where are the girls? Wait, they aren't going to fly on them? WHAT??? And there were a bunch of other little things that bugged me (wow, but there's an over usage of adverbs! Some I can see were part of the charm, but... I don't think ALL!!!) But when keeping in mind the audience intended for this book, it's really quite fun and cute and I can see how a whole fandom of kids are in love. Do you want a summary? I forgot that that's the method here. So Hiccup goes out with his friends to charm up a dragon. And they find some, but not without adventure. 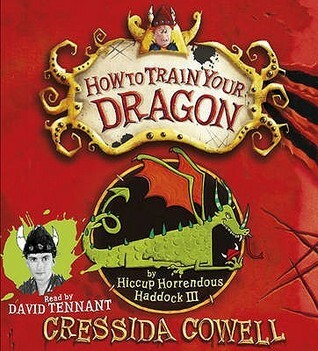 And Hiccup ends up with this little bitty thing he names Toothless and proceeds to try and teach it stuff. But he is quite unsuccessful until he realizes he can be bribed with jokes. On the day of the big event where they get to show off their dragons, the dragons all get in a fight instead and now Hiccup is banished by his own father. But before that can happen, a huge dragon his awakened and threatens the town and so Hiccup, who can talk to dragons, is sent to find out what the dragon is up to. Well, he wants to eat everyone, but in the end... tiny little Toothless saves the day. Together with Hiccup's accidental contribution. And now they are heroes!! Yes. Cute. :) But nothing like the movie. Announcing the Anne of Green Gables Read Along! It's been awhile..a long long while, but we are finally doing another READ ALONG! This one is hosted by Jenni Elyse with Kami and I helping to co-host. And we plan to read ANNE OF GREEN GALBES in March! I can't remember when I read this one last. Or how many times I've read it. I just remember loving it. It will be interesting to see if it holds up to the memories now that I'm crotchety and old. We also plan to chat on Twitter using #GreenGablesRAL as we read with official chats planned for each section. We let you know as it gets closer when those will be. We also hope to have a movie night and watch the PBS series together. Details to come on that too! Want to join us? Post about it on your blog and then come link up here! Spread the news. Let's do this! 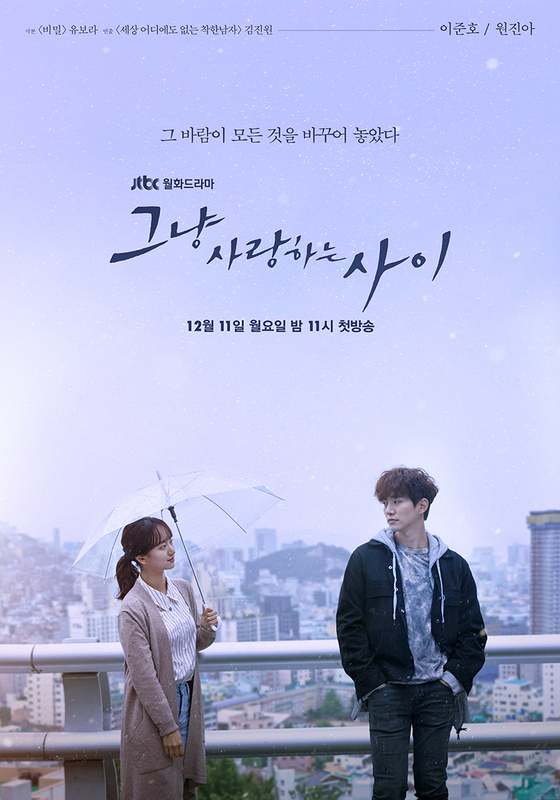 Listening: The OST (original soundtrack) from the drama I shared about in my last post. So many awesome and beautiful songs. Watching: The Olympics Opening Ceremonies (last night anyway.) It was fantastic and beautiful too. I expected some kpop groups, but I think we are hearing they are saving that for the Closing Ceremonies. Yeah. Reading: Still going through my pile of MG books, but this past week I read what will probably be my favorite one of the bunch. Stay tuned for a review this week! Making: We made piles and piles of clothes today, cleaning out the closet. We took two completly full huge garbage bags to the thrift store. It feels like a little bit of the junk load in the house is lightened. Just a little. Planning: Book club this week and making a long list for voting on our next year's schedule. Always fun! Thinking About: how I should get off this thing and go read for awhile. Enjoying: this guy's voice: (yeah my currently song changed and now it's this guy) Dang he kills me. Blogging: I failed this past week. I had nothing to give on that front. YouTubing: I joined a new little weekly meme where we make a little video on a given prompt... five songs every Friday. This past week was five songs that will be turning 10 this year. Of course, all with a kpop spin. Feeling: Full of dinner and especially horchata. I love that stuff. Looking forward to: next weekend. Holiday! Asking: What should we read for book club next year? Suggestions? So the premise of this one is that our two main characters, when they were kids, were survivors of a mall collapse. And now, 12 years later, they are still dealing with the effects of this. And have symptoms of PTSD. Especially our dude, who was buried for about a week. So when they meet up again 12 years later, our girl has no memories of the event really, but our dude, it doesn't take him long to figure out this is the girl from the mall. And now they are working together as part of project to design a memorial on the site where a new building is now, just finally, going up. Our dude's character grows from an angry young man, to a loving guy... mostly. He has found people in his life that have taken care of him over the years and part (a lot actually) of what makes this drama so awesome is those relationships. One with an older grandma lady, one with his landlord lady and her mentally disabled but bright and beautiful son. And one with a "lady of the evening" who he saved back in the day and so she has taken him under her wing and she is now like an older sister to him. He also has his true sister who he is struggling to help and provide for as she is going to medical school. Meanwhile, our girl has all her family issues to deal with too. Many after effects of what happened with the mall event as pulled them apart and made them live a lonely life. Together, they help each other deal with things, and they learn and grow and love and heal. The lead guy is played by another one of these guys who starts out in a kpop band (it's called 2PM) and then decides they love to act too. I don't know his band very well, but they have been around a long time and still plan to do more in the future after all their guys get done with the military. Junho will probably be going in soon himself. Anyway, he did an amazing job and I loved his acting. Killer. All the way around. I was interested in what Junho's signing was like, so I looked up his solos and liked this one. 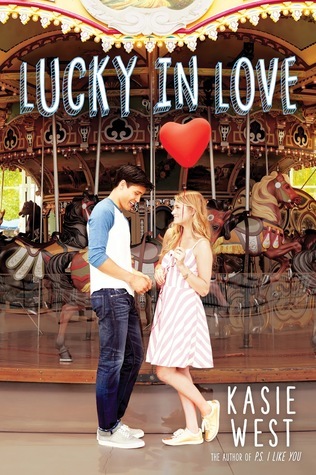 I was in the mood for a Kasie West book and this one had been waiting for me for awhile, so it was time! 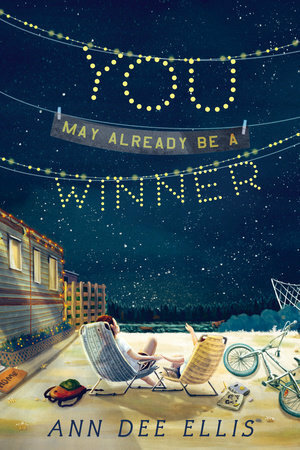 In this one we have a girl who's family is struggling with money (and other) issues and one day when she is sad that her birthday party doesn't go well, she randomly buys a lottery ticket. Well, and guess what? She wins! So then we see the progression of what happens when you suddenly have money. And she goes crazy spending it, and her friends get weird, and people who weren't her friends get weird. And her family gets weird. And she forgets everything she had planned to do in life. Except with one guy. The guy she works with at the zoo. Zoo Seth. And she doesn't tell him about the whole lottery thing (he's been off line so he doesn't seem to be finding out either) because he keeps her grounded. And she develops this pretty huge crush on him, but she is confident that he has no interest in her, because he's one of these guys who's nice to everyone and so you can't really tell what's going on. And she really really doesn't want him to know about the whole lottery thing. Things get worse with her regular life, but better with her Zoo Seth life. But despite that, all the things need to be fixed. So, while I enjoyed it a lot and read it quickly, it wasn't as, um, shall we say, as much my favorite as her other books. Probably mostly because the romance was for sure a side thing, and it's mostly about this girl's life falling apart after the lottery. So that was annoying. But still, these books are just a happy joyful thing for me to read. There's another book that just came out a month ago so I'm onto that one as soon as I get a hold of it! I gotta keep up!!! 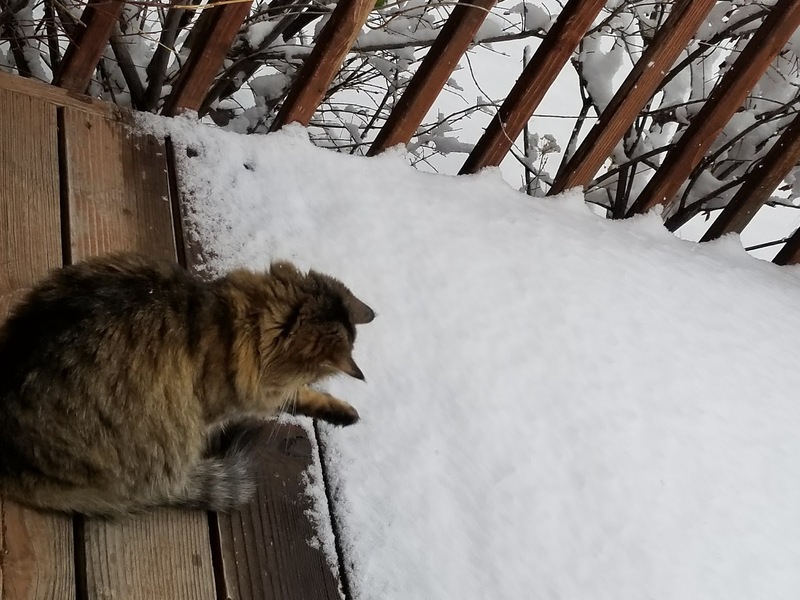 It snowed one day. The cat was interested. I actually have a little list to report on. They are all small books, but still, I read them! Under Locker and Key by Allison K. Hymas: A MG book about a kid who steals back things for people who have had those things stolen from them. And then gets himself (and his friend/not friend) mixed up in a bit of a mess. Exo by Fonda Lee: A SF story set about 130 years into the future after an alien takeover when the world has been living in peace with the aliens, yet there's still a group of people fighting against them. The Ones Who Walk Away from Omelas by Ursula K. Le Guin: A short story about a city that appears perfect on the outside, but is hiding a pretty terrible secret. Forget Me Not by Ellie Terry: Cute MG story about a girl who has moved and needs to have her new school get used to the fact that she has Tourettes. 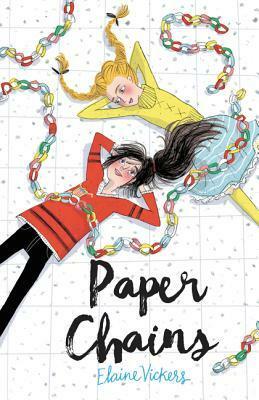 Paper Chains by Elaine Vickers: A cute MG story about two girls who are both dealing with different issues and how they help each other. Favorites of the month: Exo and Forget Me Not. I'm ahead in my Goodreads goal! LOL! I can't even remember what I said I'd try for this year. Forty maybe? We just word today that BTS song Mic Drop went GOLD in the US today. PSY did this with Gangnam Style, but this is the first group that's done it if I understand right. Anyway. We think it's pretty cool and extremely exciting. The other exciting BTS thing is that Target is now carrying their CDs in the actual stores! Like, you can just walk into a Target and buy a BTS CD... I can't even tell you how CRAZY this is! AH!!! Jonghyun, the guy from SHINee who died in December, put out an album of the songs he was working on and finishing up before he left us. They are amazing. And he is winning all sort of awards for them now too. It's happy and sad at the same time. Fanwars went ballistic this week when a US radio station asked if they should do a kpop hour every day. I'm not exactly sure what happened, but if I understand correctly, BTS fans rallied for the answer to be no because they felt no other bands should reap the benefits of their hard work getting BTS to be recognized by radio stations here. So then there was a big mess and the station backed out and said, ok fine we won't play kpop. So in the end everyone lost. As a multifandom fan, this made me so sad and for a moment, we joined in on the drama and said our piece or two, wishing that all the fandoms would love and support each other just as the groups themselves all do. Sigh. We had great fun on the channel this week discovering Qpop and have received a LOT of love from fans in that country. So much fun!!! The Olympics start next week in Korea and it's going to be very exciting to see who'll be singing at the Opening Ceremonies. Will you be watching? 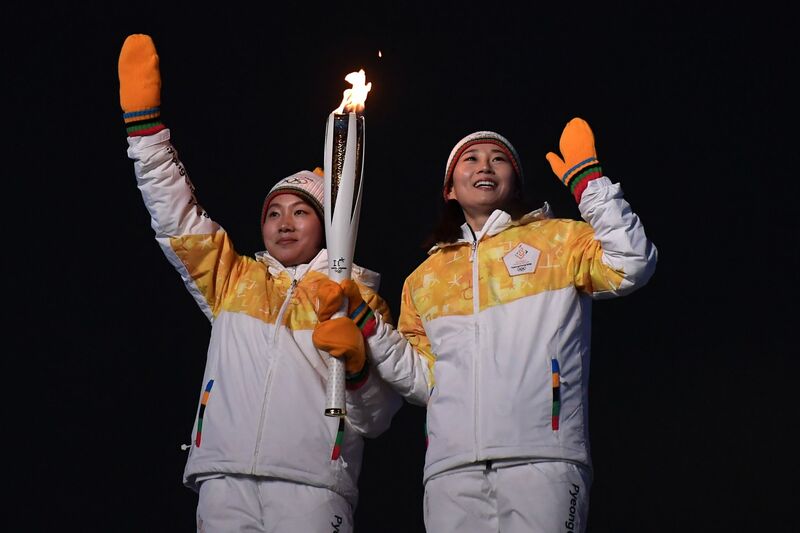 Many of the kpop groups got to run the torch these past few weeks also. It was fun to see all their pictures from the experience and see how much fun they had. There's more but I'll stop there for this week/month!! Okay, yeah, so this one is one of those that has a really stupid title. But dang, it's probably the cutest and funniest and heart warming-est one I've watched yet! The dude that stars in this one is normally in heavy dramas, and is so so serious in his normal roles. At least that's what I'm understanding since I haven't seen him in anything until this one (I'll be fixing that soon and am ready to see the oh so dramatic acting he's known for!) So everyone was making a big deal out of him starring in a romcom. This is a "trailer" they made making fun of him that he's now in a romantic comedy. And he's trying to do the crying thing... so funny. I giggle every time. But seriously, he nailed it. Like, perfectly! Sigh. Well, and so his company has been doing a secret project... to build a very intelligent robot, one that can learn emotions. So he gets to test out this robot and approve it and such. But, an accident happens, and on the day before the robot is going to be sent to him, someone spilled coffee or something right in her innards.. and she is broken. So they freak out and get the girl (an ex girl friend of the main robot creator) who the robot is modeled after, to step in as the robot. Yeah. They pay her bunch, she is desperate for money. And she thinks it will only be a few days. So everything should be okay, right? She just has to not get caught! So she steps in as the robot. Well, and of course, she is so charming that he falls in love with her pretty fast. And this is freaking him out... because of course he knows he must be TOTALLY insane to be loving on a robot! Like, what??? He's is so bugged, and it pretty much tears him up inside. But what do you know, he seems to be getting better. Like, when she's around, he can be with people. He's determined that she will be his forever. And of course, he is so charming that she falls in love with him but there is no way she can ever let him know that SHE IS NOT A ROBOT! AH!! But.. just tell him already!!! No, it is not that simple. Not the kiss... just the almost kiss. Anyway, things get very complicated from there and yeah... it's awesome. I loved loved loved it. I pretty much just want to watch it all over again. Except for the parts with the American dude. I don't get it. How can they get such terrible actors for the English/America parts? Always this happens! Can they not find someone that can pull of a little side part of someone that speaks English? Everyone else is so good, but then the American actors come in and BAM.. ugh. Please fix this Korean drama casting people! This story is told by two different girls, alternating between their points of view. One girl is Katie and she struggles with the fact that she's been adopted from Russia and the need and desire to know more about that without offending her parents. She also has heart problems and feels stifled by her parents' worry and concern for her health. Ana is her best friend, and she struggles with the fact that her hockey playing dad left them and her mom is suffering depression and her grandma (from Russia) has come to take over. Add to that her little brother is being bullied. She needs to fix it all! We get to see how both the girls feel like the other has everything perfect in her life, but we as the reader know that they don't. We go on the journey of how they both are drawn to each other, and yet have some friction that pulls them apart. And then they come together again to help each other deal with their issues. It was a well told story, but for me it dragged down a bit with the issues. It was a little heavy I thought for a MG and I feel like kids this age would have been bored with it. But it was fun to learn some Russian culture and some hockey culture!